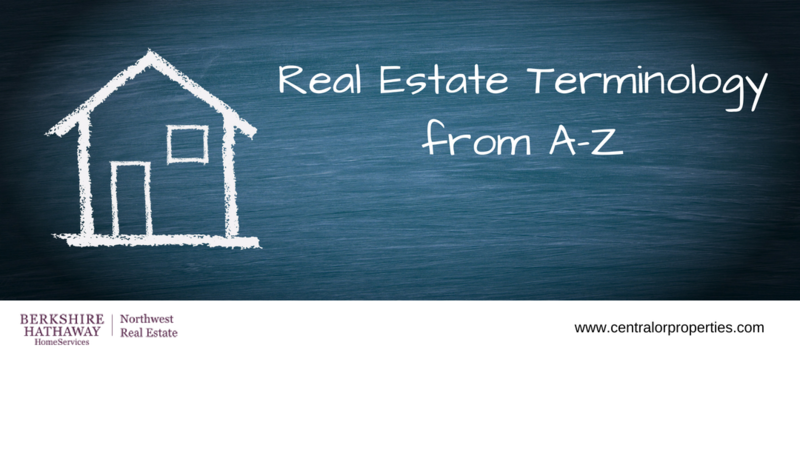 Trying to understand Real Estate terminology and abbreviations can be confusing, so here is an explanation of several of the most common terms listed from A-Z. ADJUSTABLE RATE MORTGAGE (ARM) -The interest rate is tied to a financial index making the monthly mortgage payment go up or down over time. ANNUAL PERCENTAGE RATE (APR) -The percent of interest that will be charged on a home loan for a whole year. APPRAISAL - A report highlighting the estimated value of the property completed by a qualified third party. This is typically done for the benefit of the buyer or the buyer's lender to ensure the property is worth the purchase price. ASSOCIATION FEE/HOA FEE - In addition to a mortgage, certain housing communities such as townhouses or condos have a monthly fee associated with maintaining the common areas and amenities. This fee is typically billed monthly but can also be billed quarterly or yearly. BALLOON PAYMENT - A long-term mortgage loan that starts small but has a large payment due at maturity. BUYERS AGENT - A Real Estate Agent or Broker who represents the Buyer in a transaction. CLOSING - When the new title to the property is officially recorded by the County Recorders Office and ownership of the property transfers to the new buyer. CLOSING COSTS - The buyer and seller have expenses associated with the transaction other than that of the actual cost of the home. For example, the buyer has a variety of fees due for obtaining a new loan and the seller must pay the Real Estate Agents commission. CLOSING DISCLOSURE - A form that provides the final details about the mortgage loan. It includes loan terms, projected monthly payments and how much the extra fees will be. COLLATERAL - Something of value (in this case your home) that is held to ensure repayment of a mortgage or loan. COMMISSION - A percent of the sales price of the home that is paid to Real Estate Agents. The seller pays commission to both the buying and selling Agent. COMPARABLES - Homes in the area surrounding the home that a buyer is interested in purchasing that have recently sold and that have similar features. CONTINGENCIES - Conditions that must be met in order to close. Contingencies are typically tied to a date, referred to as a deadline. If the contingency is not satisfied the contract may be cancelled. COUNTEROFFER - The response from the seller in regard to an offer. DEBT TO INCOME RATIO - A lender will evaluate whether a borrower's income is large enough to handle their payments on existing debts plus their new mortgage payment. DOWN PAYMENT - A percentage of the cost of the property that is paid up front as a part of the mortgage. EARNEST MONEY - The deposit made from the buyer to the seller when submitting an offer. This deposit is typically held in trust by a third party (often an Escrow Company). Upon closing the money will generally be applied to the down payment or closing costs. ESCROW - Typically refers to a neutral third party that holds funds such as earnest money or a down payment in trust, and handles the processing of sale, title, and loan documents on behalf of a buyer and seller once all conditions are met. Escrow oversees a real estate transaction, from initial deposit to final funding and can also refer to the period of time from when a offer is accepted until the sale is closed. EQUITY - The difference in the fair market value of a home versus the amount of money owed on the mortgage. FHA - The Federal Housing Administration (FHA) is a United States government agency created in part by the National Housing Act of 1934. This term also refers to a type of government insured mortgage that typically requires a lower down payment. FIXED RATE - The interest rate will remain the same for the entire life of the mortgage. HOME EQUITY LINE OF CREDIT (HELOC) - A loan or line of credit that your lender may offer using the equity in your home as collateral. HOME INSPECTION - The process in which a professional inspects the seller's home for issues that may not be readily apparent, and then creates a report for the buyer to review. LISTING AGENT - A Real Estate Agent or Broker who represents the Seller in a transaction. LISTINGS - A term referring to homes for sale. MORTGAGE INSURANCE - Insurance written in connection with a mortgage loan that protects the lender in the event the borrower cannot repay their loan. This is usually not required if the borrower has 20% or more for the down payment. Also know as PMI (Private Mortgage Insurance). MULTIPLE LISTING SERVICE (MLS) - A technology used by Real Estate Agents and Brokers to list Real Estate properties that are available for sale. This is the most reliable source for up to date listing information. PRE-APPROVAL - The process in which a lender makes an initial evaluation of how much money a buyer might be qualified to borrow based on the preliminary financial information provided. As part of this process the lender may issue a pre-approval letter which can be included with an offer to purchase. This gives the seller more confidence in the buyer's ability to close escrow, but it is not a guarantee that the loan will be approved. PROPERTY TAXES - The money a property owner pays to city, town, county and state government. Sometimes property tax payments are included in the total monthly mortgage payment and are paid by the lender on the owner's behalf. REALTOR - A Real Estate Agent that is a member of the National Association of Realtors. Not all Real Estate Agents are Realtors. REO - Real Estate Owned is a designation for foreclosed properties currently owned by a financial institution such as a bank. SHORT SALE - A situation that happens when the seller's lender agrees to accept an offer for less than the mortgage owed by the seller and allows the home to be sold rather than foreclose on the property. UNDER CONTRACT - A seller has accepted a buyers offer and has both parties have signed an agreement (or contract). This term may also refer to the transaction being in Escrow. UNDERWRITING - The process in which the potential home buyer is evaluated for their financial ability to obtain and repay a loan. This normally includes a credit check and an appraisal of the property. VA LOAN - Special loans that are available to Americans who have served in the Armed Forces, This loans are issued by private lenders and are guaranteed by the Department of Veterans Affairs.